Wearing a plain red T-shirt and black pants, Jill Anderson was still recognizable as a presence as she came through the door of Caffeine Dreams. She’s one of those triple threat artists – acting, singing, and dancing her way across stages all around the U.S.
As she entered the coffee shop, she glanced around and strode right over to the table to ask if I was the person she was meeting. 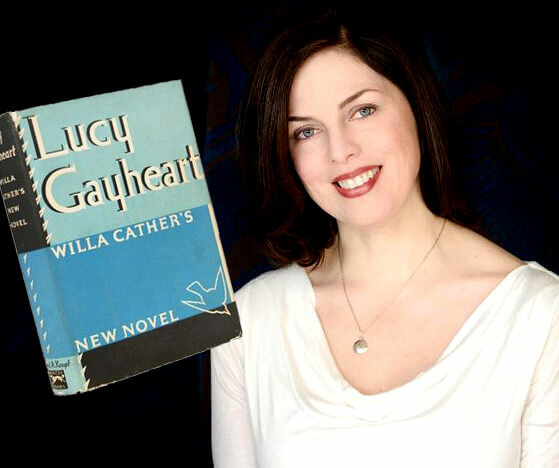 We shook hands and she sat down, immediately diving into the story of how her upcoming show Lucy Gayheart, based on a short novel by Willa Cather, had come about. It opens Friday, June 10, at Gallery 1516. Gallagher, a Nebraska native, sought out talent for this production here in Omaha. He found Anderson and professional opera singer, Evan Bravos, from Chicago. The first time the production was performed was last summer as the final event of the 15th International Willa Cather Seminar at the University of Nebraska-Lincoln. When I asked Anderson if she knew why Gallagher had chosen this particular novel rather than one of Cather’s more popular works, she said I would have to speak with him to know the full reasoning behind his motivation. In a phone interview with Gallagher several days later, his enthusiasm for the story and excitement for the production poured forth. Gallagher said the novel is often viewed as a shadow of Cather’s 1915 novel, The Song of the Lark. Though the two seem to follow similar story lines – a musically talented young woman from the Midwest moves to Chicago – Gallagher said there is one major difference. For Gallagher, the important difference between the character of Lucy and that of Thea Kronborg, the character she is often compared to from “The Song of the Lark,” is that Thea, “by design, set her sights on being an artist and she succeeded in it.” He said Lucy is a much simpler character. She never expresses a need to be a professional musician. Gallagher said that for this production, he imagines the narrator as a woman familiar with Lucy’s story. Perhaps she was in Lucy’s circle and witnessed the events and is now recounting the story to some friends. It is a one-woman show of sorts, with Anderson as the narrator. But of course, there’s also the music. Sitting in Caffeine Dreams with Anderson as she reads me some excerpts she’s found that she believes really represent Cather’s work, her voice takes on that resonance associated with theatre actors. It slows a bit and deepens just a shade. Her eyes sparkle and every word she says is deliberate and meaningful. It’s easy to see, and hear, why Gallagher chose her for this role. Her enthusiasm for the production matches his own. They got that opportunity when Anderson met with Patrick Drickey, the owner of Gallery 1516. When she heard he was doing a Nebraska landscapes exhibit of visual art paintings, she thought it would be a perfect fit for the Cather production. “This event is as much about premiering this new gallery as it is about this beautiful production,” she said. “It’s a combo meal,” she added laughingly. You can check out this audio/visual feast Friday and Saturday, June 10 and 11, at 7:30 p.m., and Sunday, June 12 at 2, at Gallery 1516. Ten Questions with NOTHINGLove Above and Below the Surface.